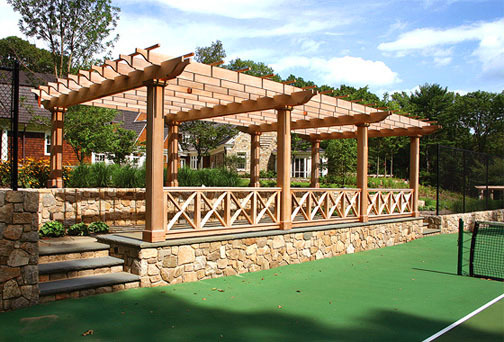 The vintage-style cross railing fastened between large posts on this large pergola helps to establish a traditional viewing area for tennis matches. The pergola, with double main beams and substantial rafters, will be covered with vines growing from a garden along the back wall. 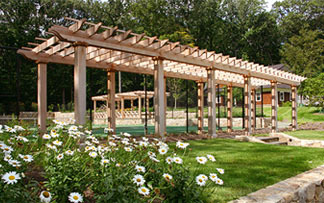 Another pergola, in a similar style, establishes a walkway on these lovely grounds. 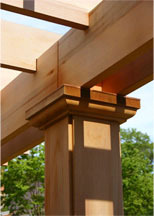 Both pergolas have been designed to reflect the classic architecture of this stately home.